ISIL enters areas afflicted by weak governance, an active war economy, and ongoing conflict with the intention of changing this situation and imposing control to ensure the longevity of its rule. Excerpted from ‘ISIL, JAN, and the war economy in Syria,’ by Rim Turkmani, (LSE, 2015), which is based on original empirical research drawing on interviews with a range of respondents who live both inside and outside ISIL held areas in Syria. It explores how the collapse of the state and the spread of the war economy enable ISIL’s expansion and JAN’s infiltration in Syria with particular focus on ISIL and presents options to counter this dynamic. Demotix/Björn Kietzmann. All rights reserved.One of the least discussed aspects of ISIL is its practice of governance. ISIL’s governance highlights a pragmatic side backed up by effective planning, and is informed by an awareness of the impact that poor governance would have on its ability to hold on to power. Governance is more important to ISIL than JAN because the sole control of territory is at the core of ISIL’s vision. It seeks to impose itself as the only legitimate actor, the state, the actor who has monopoly over violence and the only one in charge of the public good as it defines it. It thus assumes responsibility for governance, which in itself becomes a way for ISIL to reinforce its control. Its reputation for governance, centred on security provision and delivery of basic services, is a key recruiting tool not only for fighters but also for civilians to move to or remain in their areas. The local populations in areas under ISIL control fear the consequences of rising up against the new oppressor but also see no urgent need to, as they are frequently more secure under ISIL control. ISIL enters areas afflicted by weak governance, an active war economy and ongoing conflict with the intention of changing this situation and imposing control. This is done not for the benefit of the people but as a means to ensure longevity of its rule. The imposition of law and order is always the first priority. This ensures that like a state, ISIL has a monopoly on the legitimate use of force. No other parties are permitted to carry weapons, with the exception of tribes that have sworn allegiance to them and were allowed to keep their arms under the condition that they are not used against ISIL. Unlike in the rest of Syria, there are no rival militias or any other form of power to rival the dominant one in ISIL-controlled areas. 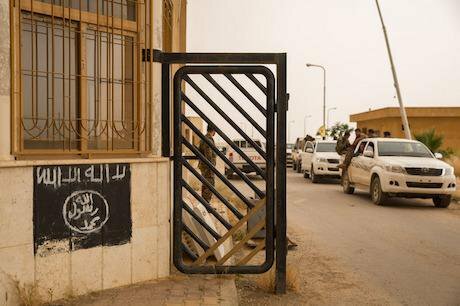 As a proto-state ISIL provides its own police, security services and even its own intelligence. 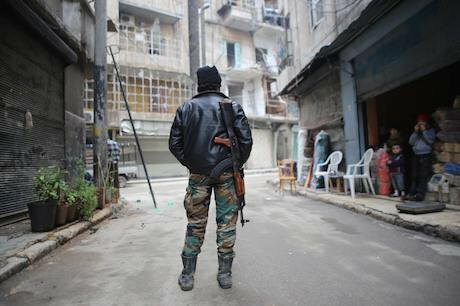 Robbery, extortion and murder are reported to have almost disappeared in ISIL-controlled areas. Even tribal disputes seem to have decreased. ISIL has achieved this through tough, brutal but organised security measures, adopting both hard and soft power measures. ISIL has established Makhfars that function as police centres. These serve to resolve conflicts and issue incident reports. Disputes are referred to Dar Al Qada’a, the House of Justice. They have also established Religious Police, al-Hisba, which carry out patrols, control the prices in the market and other violations of their rules. In some areas such as Aleppo and Raqqa there are also local ISIL police, which function with al-Hisba as the executive body for the Shar’ia court. Crucially, ISIL members are subjected to the law and are held accountable by Dar Al Qada’a if they violate ISIL’s rules. ISIL also established the Islamic Administration of Public Services (IAPS) to oversee various public services especially bakeries. ISIL uses a highly strict interpretation of sharia law. It detains people arbitrarily and uses torture; abuses of human rights in its detention centres are rife. ISIL prisons, such as the one in Manbij and Al Bab, are reported to be not much better than those of the Syrian government itself. They have also established a Religious Outreach and Proselytisation (Da‘wa) Department and their own education system. In terms of security and governance, ISIL-controlled areas benefit positively in comparison with other areas of Syria. The villages in ISIL-controlled areas tend to be subject to less governance and oversight than the cities and towns. They are left to be run by the local people with allegiance to ISIL. There are no al Hisba or Makhfars there. According to those we interviewed, this is mainly because ISIL does not have the capacity to cover all the villages and because it does not see many of them as strategic at this stage. In terms of security and governance, ISIL-controlled areas benefit positively in comparison with other areas of Syria. Many areas controlled by opposition forces have a reputation for lawlessness, corruption and gangster-like rule. ISIL coordinates hospitals, bakeries, humanitarian aid and the running or repair of infrastructure of all kinds, from the water pipelines to large dams and power stations. It ensures that civil servants paid by the Syrian government actually carry out their work, which again is not the case in all areas of Syria. All this is to ensure that, just as it secures a monopoly over the use of force, it has a similar monopoly over vital services. ISIL’s management of water and power is a prime example of how it ensures proper service delivery to those under its control; it does so with the ambition of creating an air of normalcy. In Deir Al Zour, people we interviewed reported significant improvement in the provision of water and electricity in the area. They said that before ISIL arrived they would typically have had several consecutive days without electricity but after ISIL’s takeover, people had been getting at least ten hours of electricity a day. ISIL’s IAPS had also fixed water pipes, managing to provide water even to villages that had not had water for years, such as Quria village in the eastern countryside of Deir Al Zour. Water supplies had been repaired for agricultural areas, enabling farmers to farm again. People we interviewed who had escaped Palmyra weeks after ISIL had taken it over reported to us that ISIL, very quickly after it had entered the city, took over the main automated bakery in the city; ISIL offered free bread for people while also working on restoring services and fixing water pipes. They had also rapidly deployed their al-Hisba police forces. We were told that typically ISIL starts by providing all these services for free when it enters a new area and later charges people fees for services. Demotix/Ibrahim Khader. All rights reserved.ISIL also seems to plan for the long–term, reinforcing its state-like character. This contrasts with other groups in Syria that tend to be trapped in emergency short-term planning. Take for example the health system. ISIL medical services do not deal just with emergency cases but also with primary health care issues. ISIL-run hospitals are reported to be well run and kept very clean. People who attended ISIL hospitals report meeting American, British and Pakistani doctors. We interviewed a Syrian specialist doctor who had just fled Raqqa to Turkey. He had worked in ISIL-run hospitals. They were paying him USD1500 per month in addition to housing and other benefits and were very keen to keep him working there, despite the fact that he did not swear allegiance to them. He described how eager ISIL were to keep specialist doctors because most of the other doctors who worked for them were inexperienced and some had just finished medical school. He told us that to address this gap in medical expertise, ISIL has established a medical school where students take three years to graduate. ISIL’s failure to keep this Syrian doctor highlights its vulnerability. As he was becoming ever more valued and his influence was growing, ISIL approached him and asked him to swear allegiance. At this stage, he decided to run for his life with his family because he knew rejection was not an option. In Manbij, ISIL gives medical financial assistance for people to purchase medicine, and assists cancer patients financially. One interviewee reported that ISIL sends cancer patients from Syria to a specialist hospital in Mosul. ISIL’s capacity to reconstruct a state-like entity does not necessarily mean that ISIL is capable of building a viable enduring state. Humanitarian assistance is another service ISIL offers when it first intervenes in a community, partly, according to the Institute for the Study of War, to create a culture of dependency. For example, it provides lower-priced food to impoverished areas of high need. ISIL’s control of bakeries also allows it to feed local populations and maintain this dependency. In rural areas where ISIL cannot regularly provide aid and bread it offers people the opportunity to restore their livelihoods, for example by installing water pipes for agricultural use in villages. International aid is being delivered regularly once a week to ISIL-controlled areas through Tel Abyad crossing. It is difficult to know whether this aid is distributed according to need in this area, but there is evidence that ISIL has abused supplies of international aid. For example, ISIL is reported to use this aid to pay its fighters as a way of rewarding them for their services. Tribal figures we interviewed also reported to us that ISIL distributes aid to the tribes in return for loyalty. Lately ISIL aired footage (Picture 1) showing ISIL members distributing what they claimed to be the Zakat, which is the Islamic tax paid from the rich to the poor. A camera zoom into the boxes they were distributing shows the UN WFP logos. Other images showing ISIL distributing UN WFP in February 2015 also raised serious concerns. What ISIL’s success thus far has highlighted is that security and governance are issues that matter to civilian populations who are impoverished and fear for their lives. Ideologically, ISIL has not been widely or fully embraced but as an organisation with state-like operations it provides short-term relief from many of the horrors of the Syrian and Iraqi crises. ISIL’s challenge, which it appears to be well aware of, is to develop a sustainable long-term way of forging loyalty to its fledgling entity that is not based on immediate expediency. Those who oppose ISIL will have to counter efforts to build this medium to long-term horizon by demonstrating that ISIL does not have a monopoly on providing security and services. This was reported to us by OCHA in April 2015, since then Tel Abyad was liberated from ISIL and the arrangements of delivering international aid to ISIL-controlled areas may have changed.